A large group of us went to spend the night at Monhegan Island in Maine. It was mid-summer and there was so much to see,explore and paint. 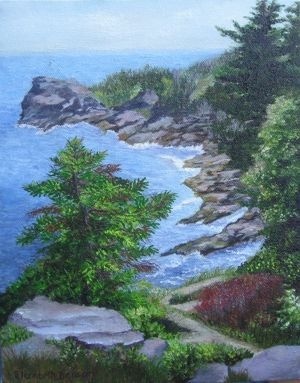 Another artist and I decided to hike out to the cliffs o the eastern edge of the island. After trekking through a forest of tall pine trees and climbing some steep paths with all our gear we reached our destination, set up our work stations and began to paint. what your looking at is the end result.